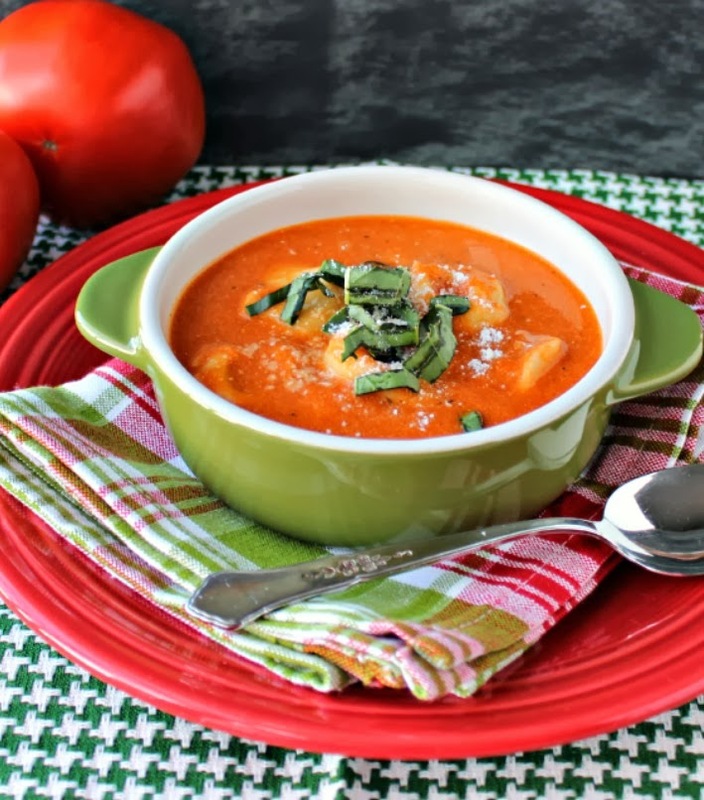 I just love a good creamy tomato soup. This recipe is a keeper. 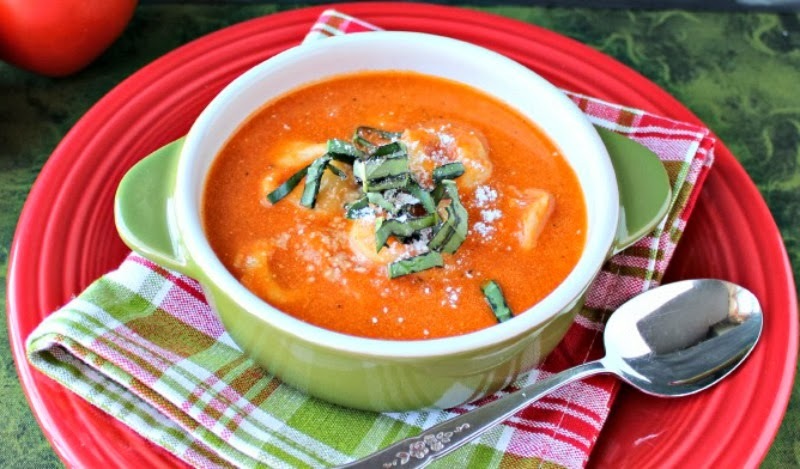 The addition of cheese tortellini makes it a good hearty soup. I found the original recipe over at Two Peas and Their Pod. I knew right away this was going on my menu for the week. I only made a few changes to adapt it to what we like and what I had on hand in the pantry. Since Old Man winter refuses to let up...why not cook up a big pot of this delicious soup for dinner this week? Heat oil in a large stock pot or dutch oven on med-high. Add onion and cook for about 5 minutes or until it begins to get tender and translucent. Add garlic and cook another 1-2 minutes, or until fragrant. Add bay leaves and crushed red pepper. Add canned tomatoes, chicken broth, and sugar. Stir and bring to boil. Turn down to simmer and cook until onions are soft. (about 30 minutes or so). With immersion blender, blend the soup until smooth. Test for salt and pepper and add as needed. Turn heat back up to med-high and bring to boil. Add in the frozen tortellini. Cook until the pasta is tender and floats to the top. (about 5 minutes). Take off heat and add in the half and half and the basil. Stir. Love, love, love this super filling soup. But then again, I if I had to pick one soup I liked the best, it would be tomato. Tomatoes are a good source of Vit A and C. Canned tomatoes are picked and canned at their peak, making them the perfect choice for the winter months when fresh tomatoes can be bland and tasteless. This soup makes a great meatless meal option. Do you love soup? What is your favorite kind of soup to enjoy? tomato is one of my favs too! Yummmmm!!! This looks great, Renee!! It's heating up here in FL, but I can still go for a bowl or two of this! Send some heat up here Marion...we'll take it! Going on my menu! sounds so delish! This looks delicious! Perfect on a old night. I do love soup and never seem to tire of having it. I can't choose a favorite I love them all. I am becoming a soup lover too...but only homemade soups. I can pass on the canned stuff! thanks Roz! I love split pea and ham too...love the smokiness it has! I am so making this next week. I love everything about that dish! I could eat soup every day and never get sick of it. My store sells crushed tomatoes for .99 cents on sale so I stocked up last week - perfect! Have a great weekend Renee! This soup has your name all over it Biz...minus the onions! Sounds so good! I posted soup this week too...it was so cold the beginning of the week, and then it reached 75 the other day (with thunderstorms and tornado warnings!). So crazy, but I was practically giddy with the warm weather! !